According to this year’s drivers for the all-girls stock car football team, sponsored by Rusted Nutz garage in Garland, the ability to be aggressive is what makes participating in the event fun. Drivers for the team are Nicole Condron, Jolene Romanosky, Megan Evans, and Pam Hollabaugh. 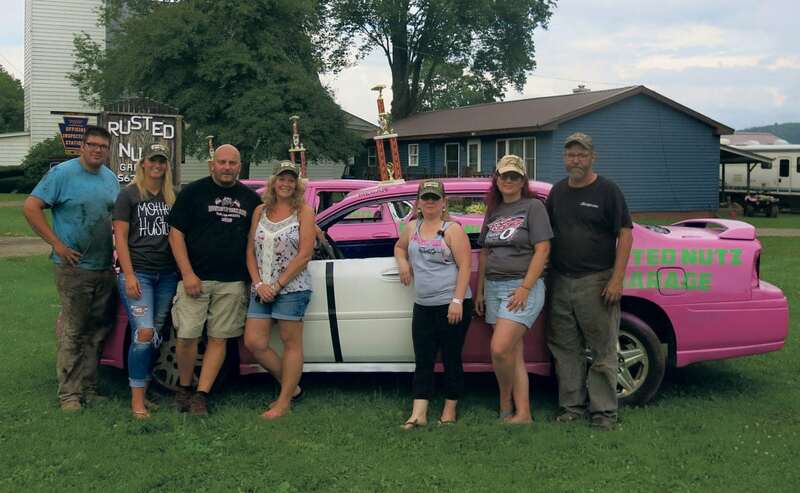 All but Condron have driven in previous years for the event, which caps off the motorsports events on the final night (Saturday) of the Warren County Fair. 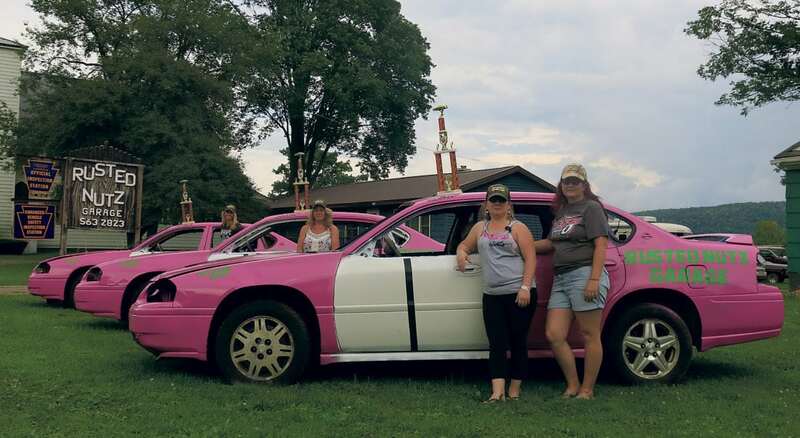 “It’s pretty exciting,” said team manager Scott Hollabaugh, “having an all-girl team that’s placed the past two years.” The team won the stock car Superbowl its first year in the event. Last year, they placed second. This year, all four drivers agreed, they’re in it to win it again. All of the team’s members — drivers and crew — live around the same area in Garland. Times Observer photo by Stacey Gross Team Pink drivers, from back to front, include Nicole Condron, Jolene Romanosky, Megan Evans, and Pam Hollabaugh. Scott Hollabaugh has been involved with stock car football at the fair on and off for 30 years. He’s got his share of experience prepping cars and drivers for the event and, he said, it’s paid off. His team, which will be known as “Team Pink” during the event, agrees that stock car football is a great way to sublimate aggression, road rage, and just to have a whole lot of fun. The event features three cars per team, with two cars per team on the field at any given time. The ball for the event, said Pam, weighs around 500 pounds and is made of a metal frame. “It will hurt you if you just run head-first into it,” explained Pam. The event requires “strategic driving, thinking under pressure, and quick driving,” agreed Romanosky. Cars can get flipped, things can catch on fire, and there is the very real possibility of injury, said Evans. And that’s apparently what makes it fun to watch. Between the expression of equality, the ability to take out their aggression, and the adrenaline rush that comes along with driving in the event, all four women agreed that it’s an event they’ll always love. Although this is Condron’s first year driving with the team, she’s no stranger to the inside of a race car. She races a Dodge Challenger at Stateline Speedway. 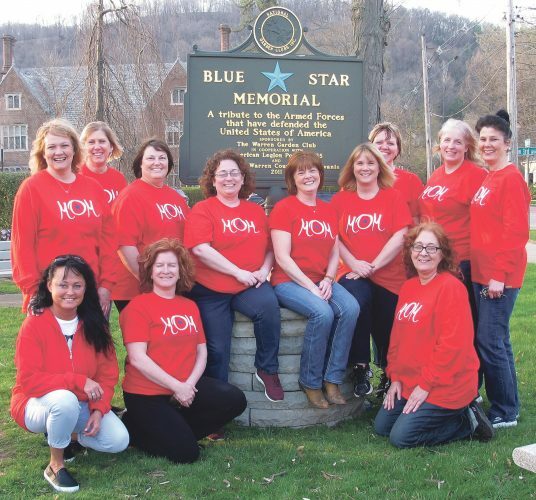 All four women also help the crew — which includes Nicole’s boyfriend John Zeleznik, Jolene’s husband Mike Romanosky, and Pam’s husband Scott Hollabaugh, and the multitude of invested friends and neighbors — to strip their cars each year. That includes welding, working on engines, and bodywork, said Evans. Team Pink has been driving Chevy Impalas since the girls started racing, said Pam. The Impala has proven to be a dependable model for them. That stands to reason, considering that the point of the game is both to get the ball across the opposing team’s line while taking care not to avoid intense crashes with said opposing team. Other factors that make a car stock car football-worthy is its ability to get hot without overheating and stalling out, and its overall maneuverability. It takes around two weeks, said Scott, for the cars — purchased at auction as junked street vehicles — to go from recognizable automobiles to stripped down shells. “You have to take everything out of them,” explained Scott. “You don’t want anything in there that could catch fire,” and Rusted Nutz-sponsored cars are all given rollbars, he said. “Cars roll over all the time” in stock car football, explained Pam. And the goal, after all, is to wreck the car, not the driver. The event, sponsored by J&M Motorsports, requires a laundry list of over 20 specifications — many with sub-specs on top — that need to be met for the car itself, including rules regarding everything from brakes and bumpers to transmissions and tires. Stock Car Football is scheduled to start at 7 p.m. Saturday, Aug. 11, at the fair’s Northwest Motor Sports Arena and is free for spectators with paid gate fees. It will be followed by fireworks at 10 p.m.
Photo submitted to Times Observer Hemlock and birch seeds often germinate on decomposing logs because they are warmer and wetter than the forest floor. 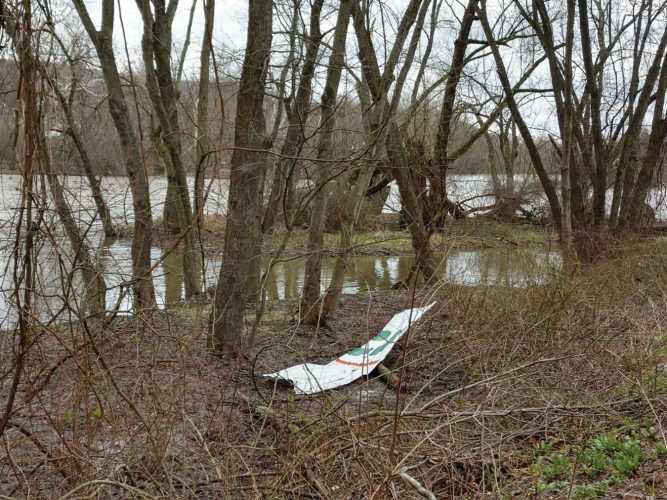 Photos submitted to Times Observer Some of the large-diameter black cherry (Prunus serotina) trees that the group cleared in order to restore the original trail corridor — using only non-motorized hand tools such as axes — are shown. This section of the Hickory Creek Wilderness trail may have been adversely affected by a straight-line wind event, with numerous trees down across the trail, all oriented in the same direction. Photos submitted to Times Observer Members of the July, 2018 FAW trail stewardship crew which worked on this project are, from left, Steve Zanoni, John Podeszek, Jean Gomory, Tom Malecki, Jude Bobnar, Luke Bobnar, Alex Bobnar, Grace Tillotson, and Kirk Johnson. Times Observer Photo by Dave Ferry There’s nothing like an evening swim in calm waters to take the edge off at the end of a humid day. Times Observer Photo by Dave Ferry It’s not quite deep enough for swimming here, and the rocky stream isn’t something Baxter is used to, but there’s still lots more trail to explore out here. Times Observer Photo by Dave Ferry Baxter in the wild off of Morrison Run. Times Observer Photo by Dave Ferry The Warr-Penn viaduct. and represents the final event for this year’s Warren County Fair.